Today is my sister-in-law’s birthday and so I have put together a list of my favorite sisters in her honor. I do not know what it is like growing up with a sister, as I only have the one brother, but these relationships made me want one. Sometimes they even reminded me how annoying I was myself. 1. Danielle – My So-Called Life played by Lisa Wilhoit. We did not really know very much about Danielle, except that she was usually jealous of Angela and had a crush on Brian Krakow. I’d like to think that if the show had lasted more than one season, we would have learned more about Danielle and her life. 2. 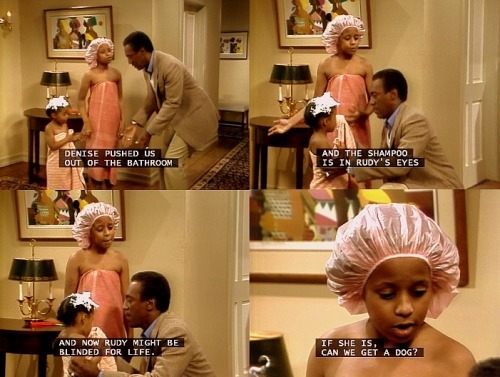 Rudy, Vanessa and Denise – The Cosby Show played by Keshia Knight Pulliam, Tempestt Bledsoe and Lisa Bonet. They fought a lot, just like siblings do, but they were also always there for each other. There was a fourth sister played by Sabrina Le Beauf, but I never really liked Sondra or her storylines and she never lived in the house with the rest of the family. 3. Ginnie, Anne, Marjee and Rose – Related played by Jennifer Esposito, Kiele Sanchez, Lizzy Caplan and Laura Breckenridge. This was a WB show that only last one season, but I really loved the family dynamic between these four sisters. They were each different and had different interests, but they supported each other and were very involved in each other’s lives. 4. Ellie – Chuck played by Sarah Lancaster. Ellie was kept in the dark about what her brother was really up to most of the time but, since their mother left when they were young, she had basically raised Chuck and just wanted him to be happy and safe. 5. Helena and Sarah – Orphan Black played by Tatiana Maslany. They have both tried to kill each other at some point, but they have an undeniable bond and, in the crazy world in which they live, have to stick together to survive. They’re seestras! 6. River – Firefly played by Summer Glau. Knowing how much her brother had to sacrifice to keep her safe, River often feels like a burden. She loves Simon and just wants him to be able to have a normal life. They have always been close and now they are the only family each of them has left. 7. Jane and Alex – Happy Endings played by Eliza Coupe and Elisha Cuthbert. They are Serbian and little crazy, but also hilarious. Jane was usually the voice of reason in this particular relationship as Alex was a little ditzy, but Jane’s dream was for them to both move to the suburbs and raise their families together. 8. Fiona and Debbie – Shameless played by Emmy Rossum and Emma Kenney. Fiona usually struggles to balance being Debbie’s mother-figure and her older sister at the same time, especially now that Debbie is dating. This family has gone through a lot together, but they are always there for each other, regardless of how badly each of them screw up.